In this topic you will learn how to add YouTube videos to a portal experience. 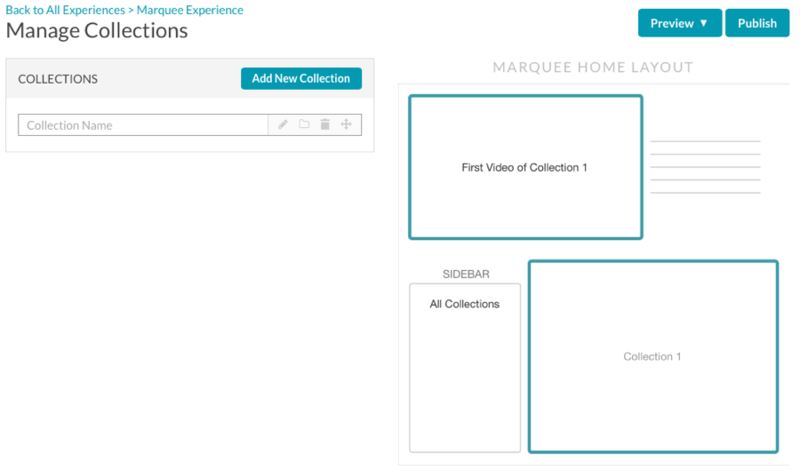 Using the Gallery Collection Editor, you can select which videos to make available on a portal experience. With portal experiences, videos are organized into collections. 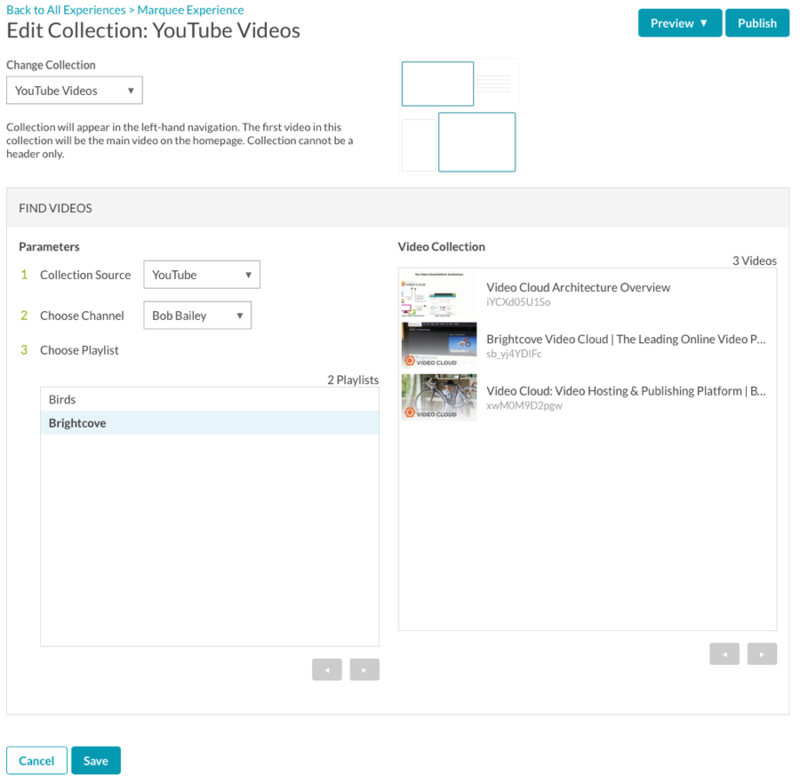 Collections can contain videos from a Video Cloud account or from a YouTube channel. This topic will focus on adding YouTube videos to a collection. 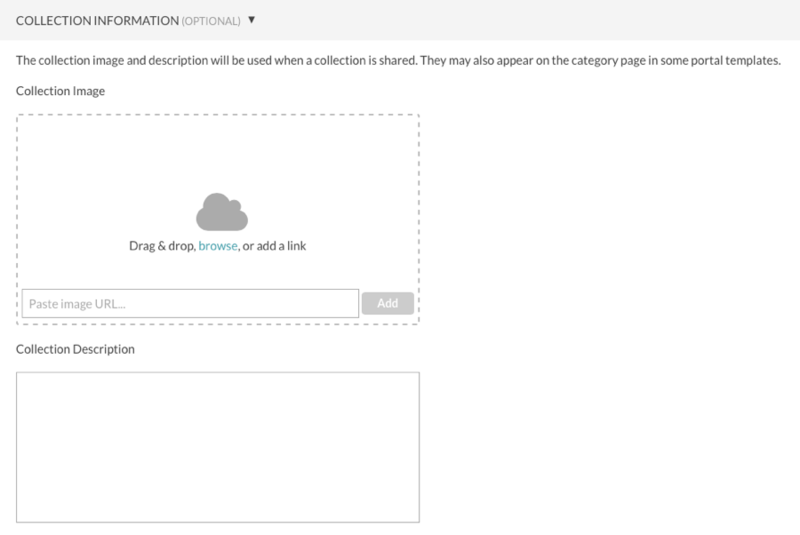 For information on adding Video Cloud videos to a collection, see Adding Video Cloud Videos to a Portal Experience. Only videos in YouTube playlists can be included in a collection. Videos that are not part of a YouTube playlist will not be accessible through the Gallery collection manager. Playlists must also have the Playlist Privacy setting set to Public. Click the VIDEOS in the left navigation. The Manage Collections page will open. The right side of the page displays a preview of the home page video layout for the selected template type. Video Cloud - Video Cloud video content will be used. For information, see Adding Video Cloud Videos to a Portal Experience. YouTube - YouTube video content will be used. Select the YouTube Channel to use. Select a Playlist. Only videos that are in a playlist will be displayed. The Collection Image is used to represent the collection on a Gallery site. If no collection image is specified, Gallery will assign one using the video thumbnail from the first video that are in the collection. To add a collection image, click Browse and select an image from the file system. You can also drag and drop an image to the designated area. 1. How are Analytics reported? The Analytics module groups the number of plays for all YouTube videos and reports them as one item. 2. Can a collection contain videos from both YouTube and Video Cloud sources? No. Each Gallery collection can only contain videos from one source. However, Gallery sites can include multiple collections so it is possible to have a Gallery site with content from both YouTube and Video Cloud. 3. Do the YouTube videos in Gallery have to come from my own channel or can I use videos in other publishers’ channels? Videos in your own channel as well as videos from any “featured channel” that you’ve linked to can be used. This allows companies with multiple channels (all linked on YouTube) to include videos from any number of them in a single Gallery site. It is also possible to include videos from channels that don’t belong to you in your Gallery site. 4. How is the YouTube video metadata used in Gallery? This metadata is used the same way as the metadata from Video Cloud videos, it gets added to the <meta> tags in the head, used in the site map, etc. 5. If the Brightcove Player configured for the Gallery site is an Audience-enabled player, will the Audience module capture viewing data for YouTube videos? Yes. Lead Forms are also supported. 6. Are Gallery lead forms supported for YouTube videos? 7. Are there any restrictions on which YouTube videos can be used in a Gallery site? For example, if the YouTube video does not "allow embedding", can the video be used? Also, what if a video is marked as unlisted or private?